You know that thing about your house that you really want to change, but it takes you a while to mull over how to change it? Well, that thing for me was our garage doors. They are the two giant doormen that greet me at least five times a day as I run errands and taxi my children to and from school. I always thought they could be a little more polished and more inviting. In this mulling over period I dreamt of painting the garage doors and boosting the character factor by adding grilles to the windows. I even created a paint preview to see what it would look like. I fell in love immediately and the hulking gray doors’ fate had been sealed. I wasn’t exactly sure how I was going to add the grilles (cross pieces in the windows.) I thought about cutting up paint sticks or just plain strips of square dowels cut to fit, but I REALLY wanted them to look as real as possible and I liked the router profile of the real deal. A few months later I literally almost tripped on a stack of donated window grilles at my local Habitat for Humanity ReStore. You know, the cheap ones that are pressed up against the window and always fall out. Grrrr! That was when the “A-ha” moment happened and I figured that I could use them to dress up my garage doors. I carefully measured the panes on the garage then found a set of four grilles that would give me two cross pieces per window! Perfect! And the best part about those grilles is that they only cost $2 a piece. For $8, some paint and glue I was able to transform my garage doors from boring bland to cottage charm! And here is the tutorial for how to add grilles to plain jane garage door windows! No power tools needed. A handsaw works great. 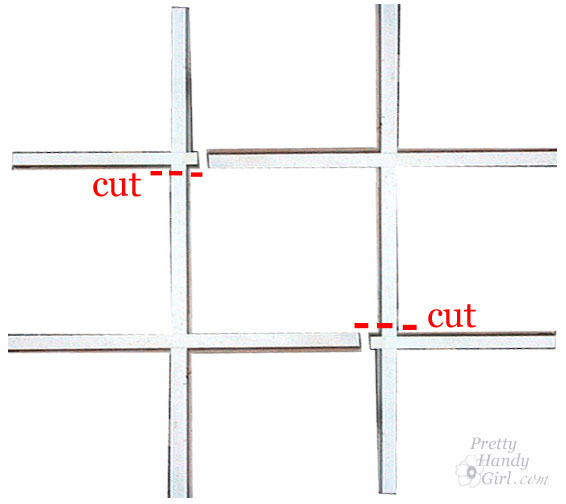 Next, cut off the excess so you are left with two crosses that fit perfectly in the window panes of your garage door. Test fit the cross. If your measurements are off, no worries, 1/2″ gaps can be filled with caulk. After cutting all of the cross pieces, clean them off. 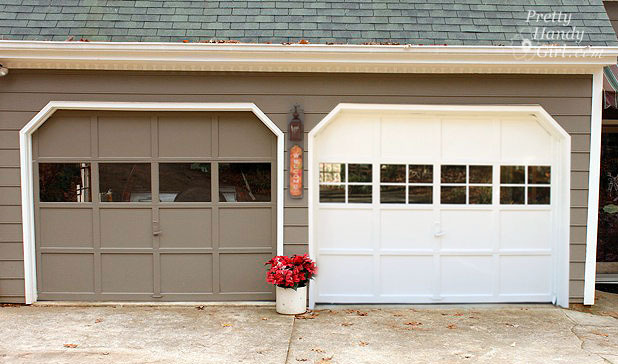 Lightly sand and paint them the same color as your garage doors. After the paint is dry, clean the glass with windex and then use rubbing alcohol to remove any dirt and debris from the glass. Spread a bead of Loctite Outdoor Adhesive onto the backs of both the vertical and horizontal bars. Center and press the grilles onto the glass. Use painter’s tape to hold them in place. Wait 24 hours for the glue to harden and dry. Then scrape any excess glue off the glass with a razor blade. 3.) 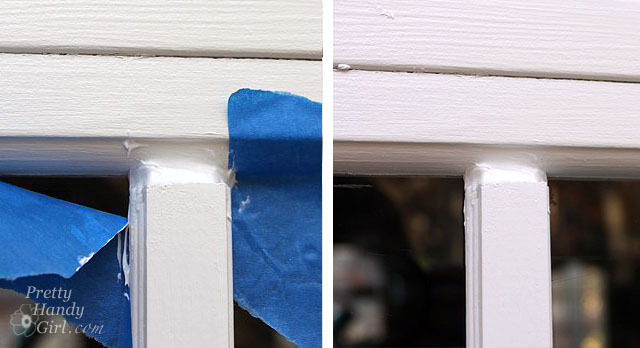 Remove the painter’s tape while the caulk is still wet. Let the caulk dry. And you’re done! How is that for adding instant character?! I could kiss these beauties! They are definitely welcoming doormen now. Okay, one more lookey at my beautiful garage door windows and then you have to leave. I want to give a big shout out and thank you to Waste Management and The Bagster who helped make my garage makeover a possibility. You can see more of my garage transformation here. Looks great! Your house is cute as a button! I love it! You are amazing… you make everything you do look so easy. What a transformation! LOVE. Re-Store just has whatever anyone donates. Does Home Depot sell them? Or?? Thanks! this looks great, love how it turned out. how many layers of glue did you have to use to fill the gap between the horizontal and vertical bars? Sooo cute!! I have solid panel doors, so I did a “faux carriage doors” paint job. Mine lacks the depth that the grills give- so I am off in search of them!! Thanks for the frugal fix up!! any further just in case the window is the wrong size. offers great durability than other traditional window materials such as wood or aluminum.